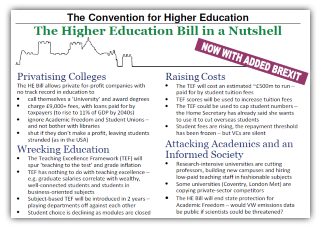 After weeks of detailed line-by-line debate at Committee Stage over two months, the Higher Education and Research Bill returns to the full House of Lords debate at the ‘Report Stage’ from Monday March 6th. The House will be voting on a set of amendments put forward to a full vote by the Committee. It is fair to say that the Lords have subjected the Bill to a far greater level of critical scrutiny than the Commons, where Jo Johnson has so-far relied on an inbuilt Conservative majority voting with the party whip to see off any criticism. Voting at Second and Third Readings on the unaltered Bill divided simply on party lines. The Conservative and DUP MPs voted for the Bill. Every other MP voted against the Bill. There is now a real opportunity for those of us opposed to the Bill to influence events. Amendments passed by the Lords will be sent back to the Commons for the Final Reading. At that point, Conservative and DUP MPs will have to decide whether they should support the amendments. All colleagues can use the UCU Lobby a Lord tool to raise concerns with Lords and ask them to vote in support of critical amendments. Colleagues, especially those in Conservative and DUP constituencies, should restart the process of lobbying their MPs. There is a Lobby Your MP tool on the UCU website. Try to find out where your MP is having a constituency surgery and arrange to meet them in person. As some 200 amendments are proposed, and some may be difficult to follow, Prof David Midgley for the CDBU has prepared the attached briefing on what the CDBU believe are the key amendments. 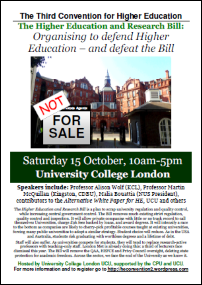 UCU has also produced this briefing. We will also provide up-dated information on the progress of amendments through the Lords on the Convention website. This entry was posted in HE BIll, Uncategorized and tagged amendments, house of lords, lobby. Bookmark the permalink.